Back by popular demand, the JET Programme Video Contest 2017 continues where the previous contest left off—showcasing the hidden charms of Japan’s local communities as seen through the eyes of current and former JET participants. The grand prize is 100,000 JPY in travel vouchers! The submission deadline is Thursday, 30 November, 2017. As part of a larger initiative to help globally conscious JET Programme participants in their job-searching efforts, the Nagano Prefectural Government and the Association of Nagano Prefecture for Internationalization held their own version of the JET Programme Career Fairs by hosting the first ‘Global Career Fair in NAGANO’, supported by funds from CLAIR and cosponsored by CLAIR and Shinshu University. This independent Nagano Prefectural Government initiative was held in collaboration with the local university, Shinshu University and therefore was not limited to JET Programme participants but also open to international and graduating students enrolled at educational institutions in the prefecture. According to a Japan Student Services Organisation (JASSO) investigation conducted in May, 2016, there are approximately 1,400 international students attending institutions of higher education, a number that is set to rise. To capitalise on supportable personnel, the Nagano Prefectural Government developed a ‘Global Nagano Strategy Plan’ in October, 2016. Presently, there are a lack of opportunities for international students to meet and network with companies in Nagano Prefecture. As a result, many of these global talents either return to their home-countries or find employment in and around Tokyo or other metropolitan areas. This Global Career Fair was hosted to provide a means for companies to meet and hire highly knowledgeable and skilled foreign nationals who might contribute to the development of local industry, education, and the revitalisation of the local communities. The Global Career Fair in NAGANO 2017 was held on Saturday, 20 May, 2017 from 13:30 to 17:00, at the Shinshu University Advanced Science and Technology Centre (SASTec). Participants listening to company representatives. 25 companies and 60 JET Programme participants and international students joined in the event. 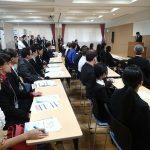 The participants, who travelled to Nagano from other prefectures could be seen moving between company booths and actively listening to explanations made by company representatives, making the most of the allotted time. Additionally, there were booths established in cooperation with the Nagano Prefecture Certified Administrative Procedures Specialist Association that provided consultations related to labour conditions and status of residence as well as representatives from the multicultural living section providing advice regarding life in Nagano. Officials at the booths handled questions from both companies and participants. According to a survey conducted on the day of the event, 90% of participating companies answered they were either ‘satisfied’ or ‘somewhat satisfied’, and 86% of participants responded that they were either ‘very satisfied’ or ‘satisfied’. Regarding the demand for these kinds of fairs, 95% of participating companies responded that they were either ‘necessary’ or ‘somewhat necessary’. The results show that the event exceeded expectations and was held in high regard by both participants and participating companies. Furthermore, participants were visibly anxious when they entered the venue and approached the booths, but they left with smiles on their faces. It is our hope that some of the participants will find employment in the prefecture as a result of this career fair. According to a survey distributed the day of the event, 90% of companies answered that hiring international personnel is either ‘necessary’ or ‘somewhat necessary’. Approximately half of participating companies said they needed to hire highly skilled personnel with specialised skills and knowledge, and approximately 30% said that they needed to employ workers for skilled and unskilled labour. This is amidst trends of expanding companies, global advancement, and a lack of personnel. With a decreasing labour pool caused by a rapidly declining population, it is of the utmost importance to secure global personnel in order to support local communities. Also, as a result of globalisation, many companies are expanding overseas and would like to hire global personnel with intimate knowledge about the inner workings of the countries they are expanding into. However, as many companies are unaware of how to secure said individuals for employment, etc., there are many companies that would like to be matched with talented individuals. On the other hand, the survey found that most international students requested that Nagano Prefecture create a job search website for foreign nationals, and more than half requested that information sessions explaining joint enterprises in the prefecture be held. While general information sessions are primarily held in large cities such as Tokyo and Osaka at present, it became apparent that local companies and international students feel a need for there to be more global career fairs. Furthermore, this career fair was held for a range of participants, including first year international students and JET Programme participants, to create a chance for participants to learn about companies within the prefecture shortly after arriving in Japan as well as to ensure the creation of a venue for participants to be matched with a wide range of prospective employers. Because of the follow up surveys with participating industries, the opinions of participating companies and individuals—furthermore, thanks to cooperating companies, universities, and organisations in the prefecture as well as the prefectural government—we were able to discern the needs of numerous companies and the requests of JET Programme participants and international students; we found that venues for matching them and sharing information are needed. It is crucial to create avenues in the prefecture for global personnel to utilise their skills and knowledge and for them to actively contribute, such as providing this kind of employment support, so we can ensure that global personnel in the prefecture such as highly knowledgeable international students will not leave Nagano prefecture or move overseas. *The Japanese version of this article was originally published in CLAIR Forum, 334th edition. 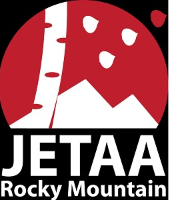 The logo of the Rocky Mountain Chapter of JETAA. For some JETs, returning home can be more difficult than their arrival in Japan on the JET Programme. 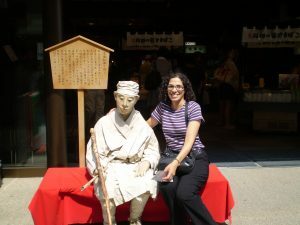 While life in the inaka (and cities) can start out a bit isolating, most JETs persevere, connect with their schools and communities, and may even come to think of their towns as their new home. Eventually, many JETs find their way back to their countries of origin only to unexpectedly face reverse culture shock. Furthermore, they need to discover their professional identities and how JET has made them exceptional candidates for their future careers. The Rocky Mountain Chapter of JETAA and fellow Alumna Emily Frank, now a professional career counsellor, have been working together to help alumni overcome these challenges. Our sister chapters in the US’s largest cities have traditionally held career seminars and meishi exchanges to help JETs network and prepare for the job market. However, the Rocky Mountain region covers over 1 million square kilometres across four US States: Colorado, New Mexico, Utah, and Wyoming. Networking and career building are difficult in our region because of the vast distances and relatively sparse population. When Emily first approached the JETAARM board about career counselling for newly returned JETs, offering help in person, over the phone, and even Skype, we knew we had a great opportunity to help JETs make the transition to becoming professionals. With generous support from CLAIR NY, we were able to start offering the Rocky Mountain JETs subsidized career counselling sessions. Emily herself knows the transition well; an ALT Hokkaido JET (1993-1996), she loved JET but knew her future wouldn’t be in teaching. 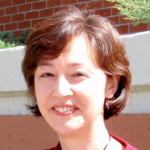 Like many of us she tried a number of different jobs upon returning home: translating Japanese for a law firm, coordinating exchange students’ trip to Colorado from Japan, culinary school, and working at a book store. She tried all these different things and still couldn’t figure out what she wanted to do. Emily herself met with a career counsellor which sparked her own discovery of the profession. Emily explains ‘It was exciting [meeting the new JET Alumni] because of how much I had in common with everyone.’ They were a diverse and high-achieving group. Even reliving being a newly returned JET was satisfying. 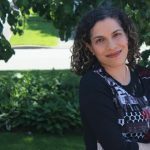 Because I had made it to the other side of finding my own career I could empathize with them.’ She notes a trend among JETs and the careers they seek out alumni often go into the education field, non-profits, or even working with refugees. JETs seem to respond to altruism, and she notes how satisfying it is to work with people who have that outlook. JETAA Rocky Mountain and Emily continue to work together to offer more support to our Alumni. We look forward to expanding career counselling services to the Heartland Chapter, another enormous geographic region in the United States. We only just started with this new venture and cannot wait to help more JETs discover their career paths. Emily herself is on the next big adventure in her career as a Private Practitioner in Career Counselling. You can learn more about her work at www.denvercareercatalyst.com. You can even mention this article for a special JET Alumni discount. 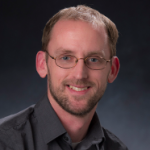 Adam H. Lisbon is the current president of the JETAA Rocky Mountain Chapter and the Japanese & Korean Studies Librarian at the University of Colorado Boulder. He struggled to find his career (though had a lot of adventures and made a lot of friends along the way) after JET but discovered his career in Librarianship when he remembered how much fun he had volunteering as a librarian for Hyogo AJET. He now helps students become literate in Japanese and fellow JETs discover Colorado’s amazing craft beer and mountain scenery. Emily Frank graduated from Smith College with a degree in East Asian Studies. After 3 years in Abuta-cho, Hokkaido, she got a master’s degree in counselling psychology. 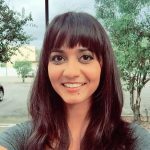 In 2006, she got an internship at the career counselling office at Metropolitan State University of Denver, where she has been working ever since. A social justice advocate, Emily most recently presented at the National Career Development Association annual conference in Orlando, Florida, on creating transgender-friendly career counselling environments. Alumni Association of Trinidad and Tobago. 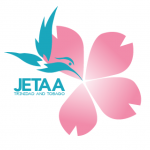 On November 6th, 2016, JETAATT President, Laurence Inniss, was invited to the JETAA International Meeting in Tokyo to inaugurate Trinidad and Tobago as the 17th member of JETAA International (JETAA-I). This was a monumental step for JETAATT. Our association had been working ceaselessly to increase visibility of the JET Programme and awareness about Japanese culture since we were unofficially established in 2013. At that time, activities were limited to small social gatherings such as ‘Welcome Back’ or ‘Farewell’ dinners. Over the years, in collaboration with the University of the West Indies (UWI), St. Augustine Campus, and the Embassy of Japan in Trinidad and Tobago, we were able to host several panel discussions and information events to spread the word about JET to prospective applicants. Today, we are able to host slightly larger events with a wider range of activities. Trinidad and Tobago first participated in the JET Programme in 2004. Since then, we have sent an excess of one hundred people on the programme, some of who have even taken up permanent residence in Japan. 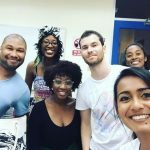 This August, Trinidad and Tobago celebrates its 14th year on the programme and has come a long way from four successful applicants to last year’s highest number: twenty-six. 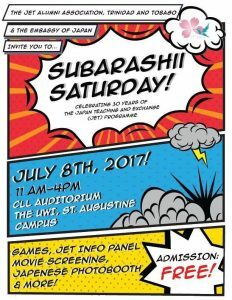 On Saturday 8th of July, 2017, JETAATT, in collaboration with the Embassy of Japan in Trinidad and Tobago, held Subarashii Saturday at the Centre for Language Learning (CLL) at the UWI. After a full day of activities for which our Head Committee worked furiously, I am pleased to say that the event was a huge success, attended by more than eighty people. While this may seem like a small number in retrospect, it is a figure that indicates to us that people are noticing our efforts and interest is growing throughout the islands about participating in the JET Programme. Activities held included: a polaroid photo booth where patrons could wear traditional Japanese dress, an origami room, a tanabata room where guests could learn about the story and how to write in hiragana and katakana, a game room, a gallery room with photographs submitted by alumni members, a movie screening by the Embassy, a JET Programme forum, and a cosplay show. 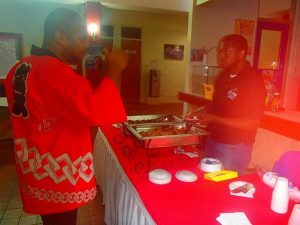 President Laurence Inniss supervising the yakitori & green tea section. Yakitori, pocky sticks and green tea were also available. Over the years, attendees were mainly persons who had actually participated in the JET Programme. On the day of our event, the auditorium – which has a capacity of one hundred seats – was nearly full. Students of the university, high schoolers, children, middle-aged and mature persons excitedly gathered to listen to the experiences of the alumni and ask detailed questions about what it was like to live and work in Japan. We received a wide array of questions: from ‘What is a typical work day like?’ to ‘How safe is Japan?’ and ‘What is it like to work with Japanese students?’, among many others. Alumni present shared their experiences regarding topics such as culture shock, daily routine, transport and medical care. We walked patrons through the application process and encouraged everyone to apply for what could quite possibly be the best experience of their lives. Alumni present shared their experiences regarding topics such as culture shock, daily routine, transport and medical care. We walked patrons through the application process and encouraged everyone to apply for what could quite possibly be the best experience of their lives. In our journey to strengthen bilateral relations between Japan and Trinidad and Tobago, JETAATT is constantly seeking opportunities to deepen intercultural communication and awareness. It has been just over a year since our association was founded, and we have been honoured to play such key roles in its establishment. We will continue to work together and pursue cooperation initiatives with other organisations to enhance visibility of the programme. Anastasia is from a town called El Dorado in Trinidad. She was an ALT in Kobe City for two years from 2011-2013. She has a background in languages, holding a Bachelor of Arts in Spanish and a Master of Arts in Translation and Interpreting Studies. She currently works as a Commercial, Consular and Cultural Assistant at the Embassy of the Argentine Republic in Trinidad and Tobago and teaches Japanese at the University of the West Indies, St. Augustine Campus. The Canberra JET Participants of 2017 give speeches. Celebrations in Australia for the 30th Anniversary of the JET Programme culminated with an event at the Embassy of Japan in the nation’s capital, co-hosted by JETAA Canberra. Rather aptly, the event was combined with the traditional farewell reception for Canberra’s 2017 JET participants, celebrating the achievements of the Programme with past and present participants. Being an official event, speeches, of course, were the order of the day. Addressing the attendees from both Canberra and Sydney, Ambassador Sumio Kusaka paid tribute to the JET Programme and its participants on how they have greatly contributed to the international relationship between Australia and Japan. He also recognised the contributions and active involvement of JET participants in their local Japanese community, such as volunteering and fundraising efforts in the wake of the 2011 Tohoku earthquake and tsunami. Michael Anziliero, President of JETAA Canberra, was next to give a speech. In wishing the departing new JETs well as they embark on their own JET adventures, he took the opportunity to highlight the role of the JET alumni community in continuing the connection with Japan, and as an important social and networking resource for all connected with the JET Programme. Pointing out the widespread network of chapters around the world, with a total membership numbering in the tens of thousands, he expressed the hope that all JETs, both current alumni and the new batch, will join and be active in their local chapters. Performing the toast, Mr Katsunori Kamibo, Director of CLAIR Sydney, related a charming anecdote: he was actually taught by an ALT from the first generation of JET 30 years ago, which shows, how far the reach of the JET Programme can be. Canberra must be rightly proud of their JET participants (which number 8) this year, with most of their participants giving their jikoshoukai in Japanese, some in almost flawless, off-the-cuff delivery (if you’ve ever wondered what spoken Japanese sounds like with an Australian accent, seek out a JET from Canberra in this year’s batch). From left to right: JETAA Canberra President Michael Anziliero, and Ambassador Kusaka. As with any event where JETs get together, old friends are re-acquainted, stories are swapped, and new networks are formed. Being able to speak with someone face to face, has always been a highly effective way to engage and motivate people, because it gives them an opportunity to engage in debate about ideas, or find their dormant interest and connection re-kindled after speaking to like-minded people. I found myself speaking to a recent returnee about job seeking strategies, I was able to make connections with alumni who were always in the background but had never engaged, and most usefully, received feedback on the activities of JETAA (good news: mostly positive). The 2016-2017 period has been a memorable one for all JETAA in Australia, as each chapter held their own celebration of the JET Programme’s anniversary, with this, the final event at the Japanese embassy, billed as the ‘official’ anniversary event for Australia. Congratulations and many thanks to JETAA Canberra and the Embassy of Japan for planning and executing such a successful event! 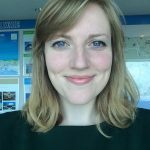 Hailing from Sydney, Australia, Eden joined the JET Programme in 2010, and experienced first-hand the generosity and selflessness of the people of Tohoku as an ALT in Iwaki-shi. He is the current President of JETAANSW, and the Country Representative for Australia on the JETAA International Executive Committee, and oversees the website and SNS for JETAA-I. He runs a podcast about the JET community called ‘Life After JET’ (Soundcloud and iTunes), and is always on the lookout for volunteers for interviews.Eden works as a web developer building and designing e-Health web portals for government and non-profits that provide online education and resources on physical and mental health issues, and to gather research and data used in the formulation of future public health policies and strategies. He can’t speak Japanese very well, which he is very embarrassed about. There is no better place to look than the JET community to find people who are passionate about Japan and the area they live in. This is why the 100 strong ALTs based in Kobe were my first port of call when looking for participants in the Kobe PR Ambassador scheme launched in 2016. In my role as PR Specialist in the Kobe City Government, I am tasked with promoting Kobe as a destination to visit, live, and do business to the wider world, from a foreigner’s perspective. Kobe PR Ambassador 2017-2018 Appointment Ceremony. Setting up official social media accounts, it soon occurred to me that there are many other people with a passion for Kobe and a large social media following, and that creating a new community of such like-minded people could not only provide a signal boost to Kobe’s promotion, but could also bridge the gap between the government and foreign residents, as well as the gaps between the many separate foreign communities in the city. Out of this idea was born the Kobe PR Ambassador scheme. In the first year, the Kobe City Government appointed 19 non-Japanese Kobe residents from 10 countries and regions around the world as Kobe PR Ambassadors. In their voluntary role, they use their social media and net presence to talk about the beauty and charms of Kobe they find in their daily lives. Their posts are shared on the Kobe PR Ambassador official Facebook and Twitter accounts, enabling other Kobe fans to see their posts in one place. Kobe PR Ambassador and JET ALT Sam Ramdani playing games with geisha in Arima, Kobe. Kobe PR Ambassadors also go on several organised tours throughout the year, where they are taken to highlights around Kobe, and given the opportunity to learn more about and promote the city. In the first year of the scheme, the PRAs went on an exclusive cruise of Kobe Port, visited Suma Aquarium and went behind the scenes, got a special taste of the Higashinada Sweets Meguri (a yearly Kobe event with a bus visiting over 40 local cake and sweet shops), and were entertained by geisha, toys, and more in Arima. Young English-speaking people who live, work, or study in Kobe and who love the city are eligible to become Kobe PR Ambassadors, and this is why I approached the JET community in Kobe – they fit the bill perfectly. In the first year five JETs took part, and this number grew to eight in the second year of the scheme; the JETs (and ex-JETs) in the group display their trademark enthusiasm, a ‘genki’ attitude, and willingness to get involved that is so often found in JET participants. After the success of the first year, the scheme was expanded in 2017 with 25 PR Ambassadors from 16 countries and regions around the world. 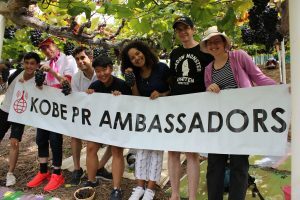 Our multilingual PR Ambassadors are encouraged to write their posts in other languages, as well as English, we have increased the number of tours from four to five, and have set up a new website at www.kobe-pra.com, featuring a blog by the Kobe PR Ambassadors, tour reports, a map of key recommended spots in the city and more. I very much hope that municipalities around Japan continue to involve local non-Japanese residents in their promotion, and particularly, that they leverage the passion and drive of JET communities throughout the country. 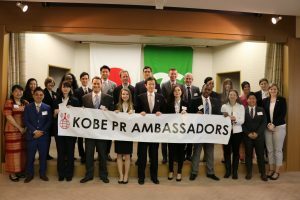 Find out more about the Kobe PR Ambassador scheme at www.kobe-pra.com. Born in Northampton, UK, Louise first visited Japan as an exchange student in 2010. After falling in love with Kobe when on a summer course, she returned there in 2011 as an ALT before switching roles to become CIR at the Kobe City Government in 2013. She took up the role of PR Specialist in April 2015, promoting the city to non-Japanese people through social media, video, print and online, and establishing the Kobe PR Ambassador scheme. She is currently Chapter Representative of JETAA Western Japan since taking up the position in April 2017. The backgrounds and experiences of JET Programme participants from France have many points of commonality, but can be quite different at the same time. Despite an academic journey including a lot of learning of Japanese language and culture, the JET Programme has unexpected professional and personal experiences lying in wait for its participants and the involved local communities. This was the case for Anthony Lieven, former CIR for the Municipality of Misasa (Tottori) from 2011 to 2016. 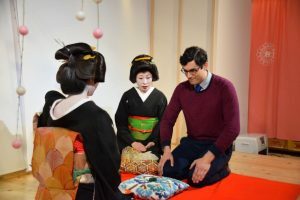 Anthony studied Japanese at the University of Paris-Diderot and it is his passion for Japanese cinema that led him to choose to learn about Japanese culture. Misasa is a spa town of a little less than 7,000 inhabitants, whose sister city, since 1990, is Lamalou-les-Bains (Hérault), a French town also known for its beneficent waters. Misasa has hosted a French CIR since 1993. Anthony had never heard of Misasa until his arrival in 2011. He thought there would be at least one JR station in town but he soon realized that there wasn’t any and that it was necessary to go to the neighboring town to take the train… He was also really surprised by the size of Misasa, being two times bigger than Paris but mainly composed of mountains. Misasa began building ties with France in the early 1950s, creating the Marie Curie Festival to honor the scientist who discovered radium, a radioactive element like the radon which gives the hot springs of Misasa its unique and healing properties. Anthony’s work over the past five years has been made up of major projects, including chaperoning of a group of school children every year in Lamalou-les-Bains. It was a lot of work and responsibility, but it is these intense moments that reflect the strong ties between these two cities. 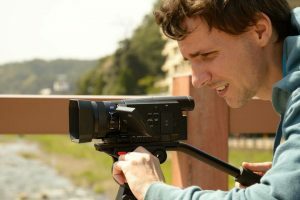 Anthony was also able to realize one of his childhood dreams by having the chance to make two films (54 and 26 minutes), with the participation of the inhabitants of Misasa. It took three years to direct these two short films that required a lot of professional and personal investment. Anthony also created about fifty promotional videos for the city. With Anthony’s passion and knowledge of Japan, the JET Programme not only helped the city of Misasa to increase its tourism promotion capacities but also offered Anthony an unforgettable experience. Anthony would have liked to stay in Misasa but he eventually moved to Tottori Prefecture due to a different job offer. He currently works in a company that creates websites and software and is involved in the research and development of medical equipment. Just like Anthony, Alice Bonamy, another French CIR, stayed five years (2011-2016) in the city of Kyoto and made unforgettable experiences. Originally from Bordeaux, Alice first studied Japanese at the University of Bordeaux III through a B.A. in English and Japanese, specializing in international negotiation, followed by a year in Fukuoka as an exchange student through the ‘Japan In Today’s World (JTW) Programme’. She completed her studies with a master’s degree in Bordeaux. The CIR position at Kyoto Prefecture had already existed for a long time but Kyoto Prefecture was hiring a French participant for the first time. During these five years Alice was responsible for interpreting, translations, cultural exchanges, and seminars and contributed greatly to building a partnership with the French region. Particularly worth mentioning here is Alice’s passion and the energy she invested in the partnership between Kyoto and the Occitania region. The many similarities between Kyoto and the Occitania region (a culturally and locally anchored agriculture, a coastal zone, a balance between traditions and modernity, and a flourishing cultural life) were another factor that greatly contributed to this partnership building. Anthony gazing at the camera with a serious expression on his face as he captures an image. Nevertheless, it took four years, until the partnership agreement was officially signed in June 2015. One of Alice’s work duties even included supporting the official Japanese delegation during their visits to France. This was a very challenging but diverse role: Alice had to jump from the translation of an official bilateral agreement to the technical interpretation for a visit of an oyster farm, while fulfilling her role as a guide and coordinator in France. Again, it is the high linguistic communication skills of French JET Programme participants that can become a key asset for contracting organisations in order to take concrete steps to create partnerships. 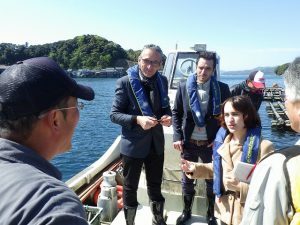 Alice interpreting during a courtesy visit by French oyster farmers to Kurimihama. Alice also had the opportunity to interpret for the leaders of the biggest hotels and ryokan in Kyoto and the representatives of a Swiss hotel school for well-known French chefs. After her JET experience and wishing to stay in Kyoto in order to be able to give back to the city that gave her so much, Alice worked in the sake industry for a year. Now, she is facing a new exciting challenge: she is currently working as an interpreter for the Japanese national cycling team and will accompany the team to every international championship until the 2020 Olympic Games in Tokyo! French participants on the JET Programme can bring a lot of value to Japanese communities. Trilingual, flexible and creative, they give impulse and a new dimension to the various local projects carried out, whether cultural or economic. Their knowledge of Japanese culture, both traditional and modern, is also an asset as they are able to work in various fields and reach large audiences, creating a link between Japan and France/ Europe but also between Japan’s local governments and their citizens. *This article was originally published in CLAIR Forum, 333rd edition, as part of the JET Letter section. From Picardy in the north of France, Aurélie studied Italian at Sorbonne Nouvelle University and Japanese at Paris Diderot University before leaving for Japan to teach French at a language school in Tokyo for three years. She participated in the JET Programme between 2010 and 2013 as a CIR in Ibaraki prefecture. She was also a Support Group Leader for all French participants on the JET Programme during her appointment. She became president of JETAA France in 2016 and after completing a master’s degree in risk and crisis management, she started to work as a consultant for the World Bank. 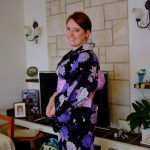 Aurélie is passionate about Japanese language and traditional festivals. Ashlie wearing a kimono. Photo by Mrs K. Hasegawa. 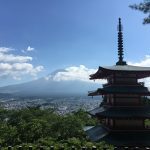 During my last month in Japan I went from Aomori to Okayama and I climbed Mt Fuji, a feat I once thought impossible as an unfit non-climber with no training. 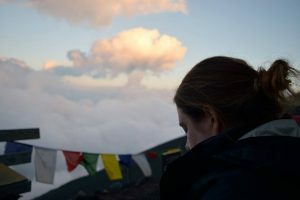 At the top of Mt Fuji, I looked down over Japan and reflected on how the last 3 years had been life changing and how much I had learned and experienced. Looking back on it now, climbing Mount Fuji was a bit like leaving JET and my experience with reverse culture shock. I had prepared myself for the climb up, the cold, the dark and the thin air but the way down was so much harder than I could have ever anticipated. A grand view of Mt. Fuji. Photo by Ashlie O’Neill. Upon returning to Australia the reverse culture shock came. I could understand everyone’s conversations, drivers were more aggressive, take-out food took longer, there was a lack of order in general, and people used phones on trains, – which still makes me nervous now. But I was not prepared for the other ways my culture shock manifested itself. I didn’t fit in anymore. It was not that my friends and family didn’t care about me, but their situations had changed. The world did not stop because I went to Japan. I changed a lot in Japan; I become more independent and learned to love the freedom that came with living alone. I was confident and a lot more outgoing. I was an adventurer, willing to try new things and meet new people. Those around me often treated me like the insecure, needy, homebody that had left in 2013 and it made me feel like I was sliding back into my old self. I found myself afraid of being out at night or catching transport alone. When I was in Japan it was easy to distance myself from bad things I heard from friends and family emergency services but when I got home I never felt safe; I lost my independence, and no longer felt safe in my own home. I lost a huge part of my new identity. Finding a job that I was passionate about was at times, soul crushing. I loved my job as an ALT. I was passionate about it but I knew it wasn’t a career for me. My degree led me to government jobs, diplomacy or politics, but did I want that? Two days after returning I began a contract as an administrator in foster care. It was emotionally draining work. My five week contract turned into five months, however, when a permanent role came up I knew it just simply wasn’t what I wanted. I also had a contract in human resources within the Department of Education, but after a while I realised the position was a lot more data entry than I had expected and was very dehumanising. In September, I attended the JETAANSW 30th Anniversary event. It was nice to see familiar faces and talk to others who were also struggling with settling back into life. Many had jobs they disliked but others had been unable to secure one at all. Talking to other people about the struggles we were all facing helped me to relax. Reverse culture shock had hit us all badly but together we were able to laugh and support each other. Many alumni mentioned that they had also felt lost before finding their current careers. They encouraged me to just keep trying and not get disheartened. I was very thankful for the chance not only to talk to other returnees but also to talk to JET alumni who told me their personal stories. One ex-JET in particular spoke to me about her job in International Student Services. I had no idea that a job so perfect for me even existed and, after talking with her, everything about my future felt a whole lot brighter and exciting. I knew that was what I wanted. Again, I began applying to jobs left, right, and centre but not even one employer replied. Still no luck. I felt more useless than ever. Eventually I contacted an ex-JET I had met in September; I told her how little luck I was having with my job search. We organised to meet up and it was incredibly helpful to get advice from someone with experience in the field. We sat and talked and she pointed out which of my skills would be most important to highlight for the positions I was applying to. With her help my CV got a much-needed renovation. We discussed the hiring process, job responsibilities, and possible other avenues for getting into international departments at universities. That week I had a phone interview, then an in-person interview and another rejection. It had been more than 6 months since I returned from JET and every application was harder than the last. It felt awful having people judge me as not worthy and not getting replies when I had spent days or weeks putting together my applications. I was miserable. Next, I broadened my search because I just wanted to start a career so badly. Early this year I attended the JETAANSW Annual General Meeting and became one of two Event Coordinators. I love spending time with other ex-JETs and people in the Japan community. With events to focus on in my free time and working with another returnee, I had things to look forward to. One day I received an e-mail from somewhere I had submitted my CV a few days earlier. We had a phone interview and the job sounded perfect. Next, I was asked to an interview. I wanted to be excited but I had learnt to not get my hopes up anymore. The interview went well. I met many members of the small team and toured the campus with a Senior Residential Assistant. I told myself they would probably find someone else anyway. I sent an e-mail the next day thanking the staff for the chance to interview with them. I received a friendly e-mail back saying they loved meeting me and would be in contact and then the all-too-familiar silence followed. The silence was broken by a friendly e-mail telling me that they were still discussing applicants and thanked me for my patience. Then, a text from the programme director directed me to my job offer e-mail. Finally, I got a job in the area I wanted to build a career. Finally, someone saw the value in me and my experience! Finally, the feeling of uselessness went away. I was finally beginning to build the rest of my life. So then, this is my advice for returnees about what lies ahead. Join your closest JETAA. They will connect you to other JET alumni, organise events, and keep you linked to Japan. No-one knows what a JET has been through like another JET. Like climbing Mt Fuji the road will be difficult, sometimes in ways you couldn’t have planned for. Give yourself and those around you time to adjust. It is ok to not be ok; this is a huge change and if you need to, reach out to someone and just talk to other returnees or alumni near to you. Be patient; it may take longer than you planned but eventually you will reach your destination. Don’t give up on your goals. In the end, it will be worth the hard work and the waiting. I met Bashō in 2007. Well, sort of. I stepped off the train and made my way through a crowd of tourists in Matsushima. Weeks earlier, I had arrived in Miyagi from Canada to take a position as an Assistant Language Teacher (ALT) in Shiogama, a city not so far from Matsushima. It wasn’t an easy decision to leave my life in Ottawa, but I had been thinking about teaching abroad on and off since my father’s death in 2003. Grief had fractured my spirit but after a while, I began to heal. After taking care of my ailing father, I realized life was short. I had been in the same job for almost ten years and had a stable life but something was missing. I needed an adventure and this led me to fill out an application for the JET Programme. My day job was a side thing to my real passion: writing. Since I was a child, I dabbled in poetry, then short stories and, after university, I became more disciplined and found the courage to submit my work to publishers. Despite the rejections, I kept writing, kept dreaming, kept hoping. Then a few acceptances appeared like cherry blossoms in the spring and these published pieces encouraged me to keep at it. As a writer, you have to take rejection in stride. Just like stumbling when first learning a language or experiencing a new culture. The initial shock can be discouraging but you have to keep going. What a fascinating culture Japan was for me! I knew I would find much inspiration in the world of cherry blossoms, kabuki, hot springs and tea houses. And, of course, there was the Japanese haiku master Matsuo Bashō. 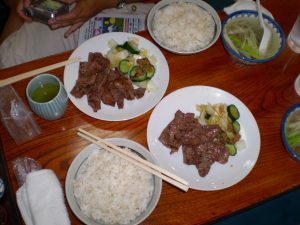 After having an interesting lunch of gyutan (never thought I’d eat tongue but it was a delicacy in Miyagi and being daring, or trying to be, I ate the beef tongue and absolutely loved it! ), I wandered around Matsushima taking in the kokeshi doll shops, the beautiful gardens and temple. Then I found a papier-mâché of Bashō himself. I inched beside him on a bench and had a photograph snapped. Cameras flashed all around Bashō. I suddenly felt pity for the poet and lowered my head for getting caught up in the frenzy. Later, I found silence on the long red bridge where I imagined Bashō praying centuries ago. What would he think about the excitement around him? Would he embrace it or seek solace in the woods? Did he pen his famous haiku about Matsushima on this bridge? I pulled out my journal, which I carried with me on all my travels across Japan, and wrote out there with seagulls soaring in the sky and waves rocking against the bridge’s beams. In Japan, I wrote and wrote. On bridges. On rocks along the hot springs. On benches in shrines. On trains. On ferries. In sushi restaurants. Late at night in my quaint apartment. I tried to capture snapshots in the form of poetry. I met wonderful people who were generous with their time and who wanted to share their culture with me. I attended shamisen and taiko concerts, participated in tea ceremonies and local events and after every experience, I created a world with intriguing characters. 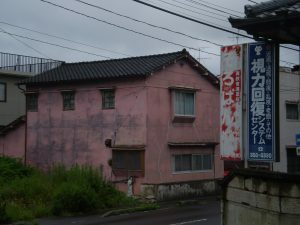 The Pink House that inspired the title poem of A Samurai’s Pink House. Across from my apartment building stood this old pink house. Sometimes I’d wake up in the middle of the night and glance out the windows, mesmerized by the mystery of that place, which appeared to be abandoned. I could, however, see shadows and I imagined that this residence had once belonged to a Samurai, perhaps a female Samurai. Many of my experiences in Japan contributed to my new poetry collection A Samurai’s Pink House. My time on the JET Programme provided the inspiration for the poems. During my stay, I met a few aspiring writers who, like myself, kept journals. My creativity and perseverance grew in Japan. It made me a better writer. To be a writer takes courage and discipline. While teaching English in Japan, I witnessed this bravery and self-control on a daily basis from my students, who struggled with a new language but never gave up, to the teachers, who spent countless hours marking papers, counselling and schooling students and supervising afterschool activities. Teaching is a vocation like writing. Both inspire. Both require compassion and patience. Getting published takes hard work just like anything else. The JET Programme was an amazing way to immerse myself in Japanese culture and I am sure Japan was and is a muse for many former and current JETs. Writing is a curious calling and if you have journals filled with words or memories that are just waiting to pour onto your computer screen, I encourage you to get to work. Set aside the time. A visit to your local library will introduce you to resources about writing. One book I found particularly inspiring was What I Talk About When I Talk About Running by Haruki Murakami. This memoir compares writing novels to running marathons. Writing is very much a marathon rather than a sprint. It can take years to complete a novel. Although it isn’t always necessary, a creative writing class can be helpful when starting out as a writer. Many colleges and universities offer these courses. Other writers want to plunge right into the world of publishing and a good place to start would be with the resource: www.placesforwriters.com. Places for Writers is a wonderful forum with calls for submissions. Like any other career, building a writing CV helps when you are ready to submit a full manuscript to publishers or agents. I would suggest submitting writing set in Japan to magazines such as Cha: An Asian Literary Journal (www.asiancha.com) and Ricepaper Magazine (www.ricepapermagazine.ca/submission). Japan was a gift to me and I wanted to thank those who helped me along the way with a book of poetry. Maybe this is your gift too? If so, ganbatte kudasai!